If you’re like most Americans, you have a 401k. Whether or not it’s neglected or not is up for debate, but as we mentioned previously, there are ways to change how you handle your 401k you can always start treating it right. If you’re interested in creating a retirement portfolio that can speak for itself, contact Kennedy Wealth Management in Woodland Hills. 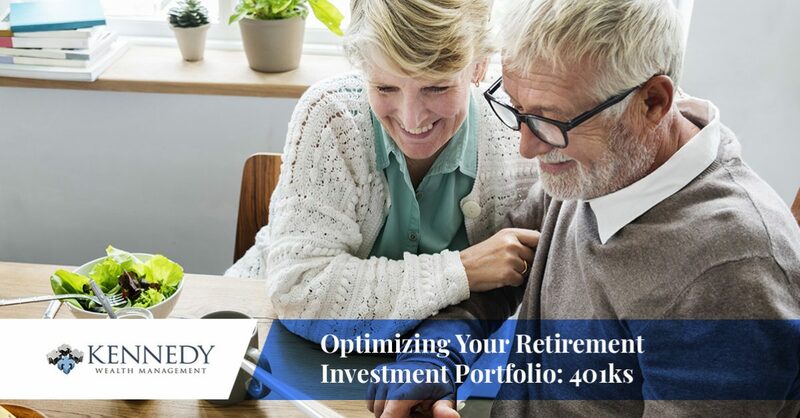 We’re equipped to guide you in designing a 401k that will support you through your retirement to the fullest extent. You’ve probably heard the “don’t put all your eggs in one basket” bit? That terrible metaphor that really doesn’t make much sense cause who wants to put eggs in even one basket let alone multiple baskets. We’ll teach you how to diversify your investment intelligently with strategies that you can focus your efforts on entirely. Essentially, you’ll need to start fiddling with where and how your money gets distributed into your 401k. To start, you’ll need to understand where your current asset mix is and where your future contributions are going. Generally speaking, these are the same thing, but there are a few scenarios where they are not the same thing. As an example, if you change your asset mix, it’ll usually default that to be where your future investments are going, which would obviously not include the past ones. But, from time to time and company to company you may have to go in and rebalance your existing retirement plan and portfolio to fit your new specifications. Additionally, you’ll need to ensure you’re keeping your financial investment risk in balance. For example, if you borrow money against your 401k to buy your first home, a generally pretty good idea, and then the real estate market crashes and you lose money on the property, you will have wanted to diversify the investment so that this won’t ruin your retirement. Try investing in stocks and bonds as well as establishing a decent savings account with your 401k. This will ensure that your portfolio’s success doesn’t hinge entirely on one area of your investment. Kennedy Wealth Management will gladly look through your 401k to find various investment opportunities that are embedded in your 401k. You can be as much a part of the process as you’d like and we can guide you through a variety of ways to diversify your own investments. One of the most notable diversifying strategies is called the “target-date fund” and it’s regarded as the most straightforward method. However, as a word of caution, it’s almost always the most expensive way to diversify. Target-date funds allow you to choose a fund that vaguely lines up with your own expected retirement date, you’ll usually choose a year sometime off in the future and then that fund will select a variety of investments that match up with the goal. The fund will continue to diversify and change as the years go by and invest in various new stocks as it continues. The second type of diversification is chosen based off of your age. You’d be doing what the fun described above does automatically but using your own financial savvy instead of a financial advisor’s that is attached to that fund. The third strategy is to have someone do the whole thing for you. Even if you don’t decide to hire a wealth management company for your entire portfolio management, we recommend getting at least some advice to start targeting your investments. If you’re not confident handling the whole portfolio over, we can at least point you in the right direction and toward better investment opportunities. We’re always happy to give our reasons for a recommendation because we know that the smarter the public is about their own investments, the better. Reach out to us when you’re ready to invest in your own future.